Homebrewers, this HBK209B-3 Triple Faucet Home Brew Kegerator from Kegco is the ideal beer dispensing option for you! It makes it easier than ever to store and tap up to three different kegs of home brewed beer, allowing you to show off a variety of flavors to your friends and family. Whether you're throwing a party for the big game, hosting a dinner for a holiday or special occasion, or simply relaxing with a refreshing glass of beer at the end of a long day, the HBK209B-3 will take serving your home-brewed beer to the next level. 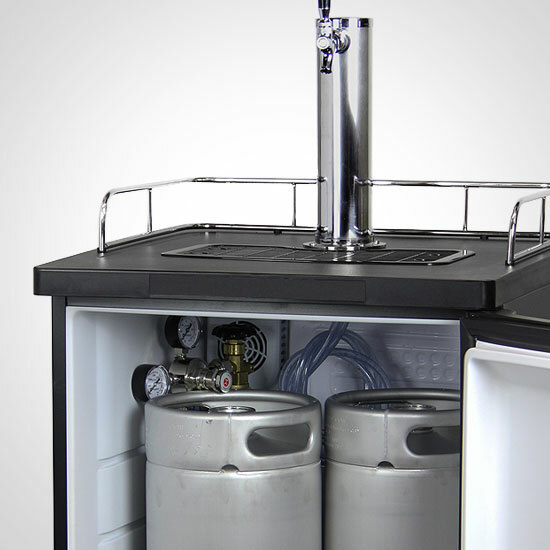 Kegco has included a specially designed three-product direct draw kit with these homebrew kegerators to give you everything you'll need to begin tapping and serving up to three home brew kegs at a time. From the ball lock keg couplers right down to the washers and fittings, we've thought of all of the high-quality parts you'll need for hassle-free assembly. We've even thrown in premium upgrades like a corrosion-resistant red CO2 tank, dual gauge regulator with 3-way air distributor, and three-faucet polished stainless steel draft tower all at no additional charge, giving this unit an extra $35 value. All you'll need to do is fill the CO2 tank and provide the kegs of beer! 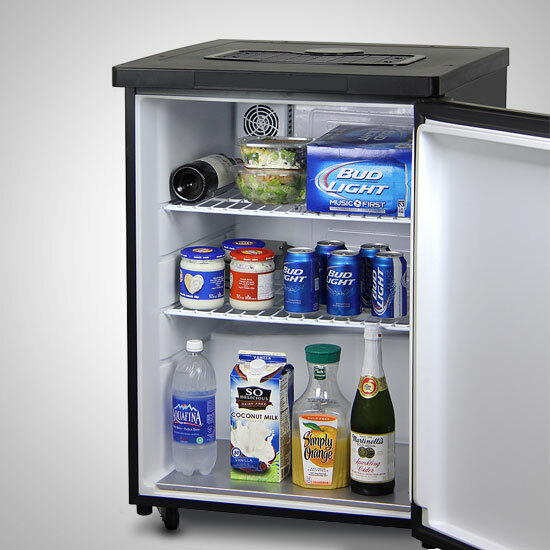 When it's not being used to store and serve delicious homebrew, this kegerator can be converted into a regular all-refrigerator or beverage cooler using the two included adjustable shelves. 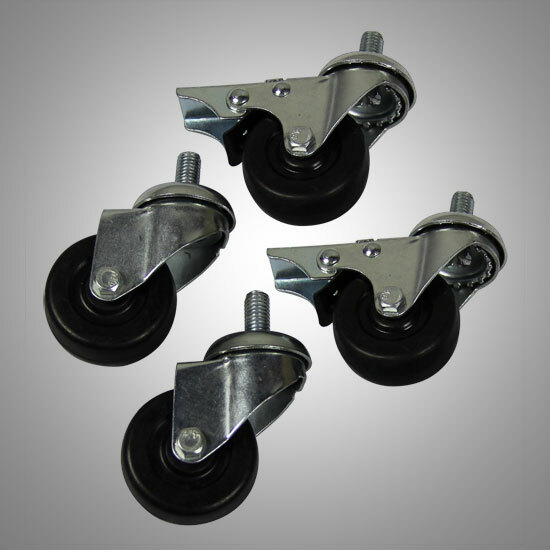 Adding to its versatility are four locking casters that allow it to be used in nearly any room in your home. 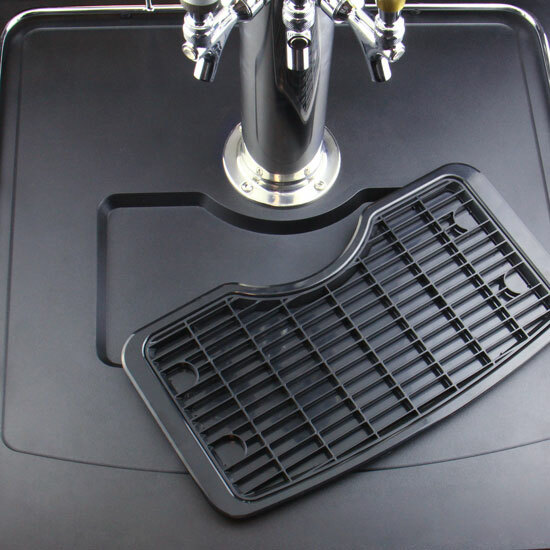 A textured top surface with chrome guard rail helps prevent your mugs and glasses for slipping off while serving, and a dishwasher-safe flush-mount drip tray sits under the faucet to catch drips and spills for convenient clean-up. Thanks to the stainless steel floor plate that lines the bottom of the cooler, the weight of your kegs is evenly distributed, helping to prevent liner damage and ensure long-lasting performance.